Brattleboro, Vt. (December 28, 2011)…Any interested dairy producer is invited to attend a special dairy meeting, hosted by Holstein Association USA, on Wednesday, January 25, 2012, from 10:30 a.m. to 2:30 p.m. at the Holiday Inn and Suites Phoenix Airport, 3220 S 48th St, Phoenix, Ariz. Highlighting the event will be presentations on the practical application of genomic technology by Dr. Roger Shanks, Holstein Association USA dairy genetics consultant, and John Andersen, manager of dairy operations for the Aardema Group in Jerome, Idaho. A prime rib lunch will be provided by Holstein Association USA, and attendees are asked to RSVP by January 16 to be included in meal counts. There is no registration fee to attend. 10:30 a.m. – "Introduction to Genomics and How It Can Be Useful to Commercial Dairymen," Dr. Roger Shanks, Holstein Association USA Dairy Genetics Consultant. Dr. Shanks has been a long-time professor of genetics in the Department of Animal Sciences at the University of Illinois, retiring in September 2010 after 31 years of service. In addition to his work with Holstein Association USA, focusing on the development of practical genetic products and services and helping dairy cattle breeders utilize genetic technologies for profitability, Dr. Shanks currently serves as editor in chief of the Journal of Dairy Science. 1:00 p.m. – "What Can AgriTech Analytics Do For You?," Bill VerBoort, General Manager of AgriTech Analytics. AgriTech Analytics (ATA) is a dairy records processing center owned by Holstein Association USA, based in Visalia, Calif., that offers a variety of services for dairy producers across the country. 1:45 p.m. – "Practical Applications for Genomics on a Large-Scale Dairy Operation," John Andersen, Manager of Dairy Operations for the Aardema Group. The Aardema Group consists of seven dairies that milk a total of 26,000 cows and two heifer facilities that raise a total of 25,000 heifers. John spends most of his time on Double A Dairy which milks 13,000 cows on one site and has a specialized calving facility for several of the dairies. The Aardema Group employs 300 people and is owned by the Aardema Family, operating in Idaho since 1980. John graduated from Brigham Young University in 1999 with a bachelor of science in animal science. He enjoys showing cows with his wife, Caroline, and their four children, and is also the owner of Triple Crown Genetics which breeds and markets elite Registered Holsteins. A block of rooms has been reserved at the Holiday Inn & Suites Phoenix Airport, 3220 S 48th St, Phoenix, AZ 85040, with a $119 rate, which is available until January 3, 2012; to make a reservation, visit the hotel's web site and use the group code "HOL". To RSVP for the lunch, contact Kelli Dunklee at 800.952.5200, ext. 4124. With additional questions about the meeting, contact Jodi Hoynoski at ext. 4261. Brattleboro, Vt. (December 1, 2011)…The 2012 National and Qualified Judges Lists are now available from Holstein Association USA. The lists contain individuals who have significant amount of judging experience and attended a Holstein Association USA Judges Conference, making them eligible to judge nationally-sanctioned Holstein shows. State and regional-level shows are also encouraged to utilize the National and Qualified Judges list when selecting judges for their shows. All individuals on the National and Qualified Judges lists are approved by the Holstein Association USA board of directors. In 2012, all National Holstein Shows are required to choose their judge from the National Judges List. Nationally-sanctioned Junior Holstein Show Judges and National Holstein Show associate judges must be selected from either the National or Qualified Lists. All individuals currently on the lists, or planning to apply for the lists in the future must have attended a Holstein Association USA Judges Conference within a three year period to be eligible. One conference will be held in 2012, on April 15, in Syracuse, N.Y., in conjunction with the New York Spring Dairy Carousel. The conference will run from 8 a.m. to 3 p.m., and is open to anyone 22 years of age or older. Registration is available on the Holstein Association USA web site. Pre-registration, available until April 1, is $50, and late registrations and walk-ups will be accepted for a $100 registration fee. View complete details or register online at www.holsteinusa.com/shows/judges_preregister.html. Tentative plans have been made for future conferences, including two in 2013, in California and Wisconsin, one in Ohio in 2014, and one in Utah in 2015. For complete information about National Holstein Shows and Junior Holstein Shows, visit www.holsteinusa.com and click on the National Shows button in the main menu. With questions, contact Peter Cole at 800.952.5200, ext. 4127, or Jodi Hoynoski at ext. 4261. Brattleboro, Vt. (November 23, 2011)...The Holstein Association USA, Inc. board of directors held its fall meeting in Chicago, Ill. on November 17-18. President Chuck Worden chaired the session. The board approved the 2012 Management-by-Objective Business Plan and associated budget, as presented by management. The Business Plan projects growth in sales of Holstein Association USA's core products and services. New for 2012, herd owners enrolled in Holstein COMPLETESM will receive volume discounts for genomic testing. Holstein COMPLETE provides a financial incentive for participating in several of the Association's products and services. The package includes membership, registration, classification, mating information, pedigrees, and production records. Management is pleased to announce registrations through November 12 were 303,800, up 3 percent over 2010. Regular transfers, for the same period, were up over 7 percent. Reporting through October, Holstein COMPLETE enrollment totaled 254,006 cows and 1,807 herds. This represents 6 percent more cows and 3 percent more herds since the end of 2010. AgriTech Analytics (ATA) General Manager Bill VerBoort reported ATA has processed records on 882,377 animals through the end of October. This is a 2 percent increase in the number of records processed the same time last year at the Association's dairy records processing center, located in Visalia, Calif. The board of directors heard reports from the Audit, Genetic Advancement (GAC), Junior Advisory (JAC), Legislative Affairs, and Show Committees. The board approved a recommendation from the Genetic Advancement Committee to officially report carrier status for haplotypes impacting fertility (HH1, HH2, and HH3) from the new 6K SNP genomic test. This will become effective with the next genetic evaluation, scheduled for December. The Junior Advisory Committee made several recommendations which the board approved. Requirements have been streamlined for juniors who want to participate in junior production awards and the scrapbook and folding display contests. In an effort to encourage more participation in junior programs, the board approved the JAC's recommendations to simplify the applications for Distinguished Junior Member and Distinguished Young Junior Member recognitions, starting in 2013. Details will be provided on the Association's website. From the Show Committee, the board approved the International Show at World Dairy Expo in Madison, Wis. and 10 National Shows for 2012. The list includes National Spring Shows in Columbus, Ohio; Stillwater, Okla.; Jefferson, Wis.; and Richmond, Utah; the National Summer Show in Columbus, Ohio; and National Fall Shows in St. Paul, Minn.; Puyallup, Wash.; Springfield, Mass. ; Harrisburg, Pa.; and Louisville, Ky. The board also approved Syracuse, N.Y., as the site of the 2012 Judges Conference, to be held in conjunction with the New York Spring Dairy Carousel, and approved 36 judges for the 2012 National Judges List and 64 judges for the 2012 Qualified Judges List. In keeping with the policy to allow the release for reuse of a prefix after 20 years of non-use, the board will release of 2,149 prefixes effective December 31, 2011. • March 22-23, 2012, Hartford, Ct.
• June 26-27, 2012, Springfield, Mo. For more information contact Lindsey Worden at 800.952.5200, ext. 4096. Learn more about any of the Association's programs and services at www.holsteinusa.com, or call Customer Service at 800.952.5200. Brattleboro, Vt. (October 31, 2011)…Holstein Association USA is currently planning nine regional member meetings that will be held nationwide between December 2011 and March 2012. Members are encouraged to attend the meeting in their area to hear the latest updates on Association business, and provide feedback on programs and services. At least one member of the Holstein Association USA board of directors and one staff member will lead each meeting, so it is an excellent opportunity for face-to-face interaction with Association leadership. Following are the dates and locations for the upcoming meetings, in chronological order. Sheraton Syracuse Univ. Hotel & Conf. Ctr. In conjunction with this meeting, there will be a dairy conference on genomics. Call Kelli at 800.952.5200, ext. 4124 to RSVP for complimentary lunch by Monday, January 16. For complete lodging information, visit www.holsteinusa.com, click on Meetings & Conventions in the main menu, and then Regional Meetings, or go directly to www.holsteinusa.com/meetings/regionalmeetings.html. With questions, or for more information, contact Jodi Hoynoski at 800.952.5200, ext. 4261. Brattleboro, Vt. (September 30, 2011)…Holstein Association USA, the world's largest dairy breed organization, is currently seeking applicants for a new Communications & Youth Programs summer internship. The internship will be based out of the Association's headquarters in scenic Brattleboro, Vt., and provide valuable hands-on experience, networking opportunities, and personal development to help students prepare for future careers in the dairy industry. Intern responsibilities will involve assisting with various communications projects and youth programs, including preparations for the National Holstein Convention. Specific tasks will include writing press releases, developing video presentations, preparing information for distribution to the media, photography, videography, feature story writing, working with the Holstein Foundation's Dairy Jeopardy and Dairy Bowl programs, and a member relations project. The internship will include opportunities for some travel, including attending the 2012 National Holstein Convention in Springfield, Mo. Qualified candidates will be enthusiastic, energetic and team-oriented individuals who have completed at least their sophomore year in college. Preference will be given to students taking a communications and/or dairy science course of study. Strong written and verbal communication skills are essential. Applications must be received by December 1, 2011 for consideration. Interested individuals should submit a cover letter, resume with references, college transcript and writing sample (not to exceed three pages) to Holstein Association USA, Attn: Human Resources, 1 Holstein Pl, PO Box 808, Brattleboro, VT, 05302-0808; or click here to submit your resume online. Amending Federal Milk Marketing Orders. The Discussion Draft is based on proposals developed by the dairy industry in the original Foundation For The Future (FFTF) plan. According to Holstein Association President Chuck Worden, "The Dairy Market Stabilization part of the program is key, and a major reason for the Association's support of the program. We plan on continuing to work with Congressmen Peterson, Simpson, and others so that new dairy legislation can be written which will benefit all Holstein Association USA members and dairy producers nationwide." Holstein Association Chief Executive Officer, John Meyer states, "We salute House Agriculture Committee's Ranking Democrat member, Collin Peterson (D-MN), and Congressman Mike Simpson (R-ID), for their tremendous leadership in putting this draft legislation forward. It is encouraging to know that we have leaders like them in Washington DC working positively on behalf on U.S. dairy farmers." To learn more, links to a fact sheet, a detailed summary, and the full version of the discussion draft can be found at http://bit.ly/DairyReform. Brattleboro, Vt. (July 6, 2011)…Holstein Association USA will be holding two more National Judges Conferences in 2011. The one-day conferences are open to anyone 22 years of age and older interested in gaining judging experience or fulfilling the requirement to apply for the Holstein Association USA Judges Lists. Pre-registration for the conferences is available online at www.holsteinusa.com/shows/judges_preregister.html. The remaining 2011 conferences will be held in Fond du Lac, Wis. on August 16 at the Great Northern Sales Arena (pre-registration closes August 2), and September 20 at the Pennsylvania Farm Show Complex in Harrisburg, Pa. (pre-registration closes September 6). The cost to attend is $50 for those who pre-register before the deadline or $100 for those registering after the deadline, and includes lunch. The conferences will run from 8:00 a.m. to 3:00 p.m. with six placings classes, as well as classroom discussion. All individuals wishing to apply for the 2012 Holstein Association USA Judges Lists, including those on the 2011 Judges Lists, must attend one of the three 2011 conferences and receive a satisfactory rating, and submit an application for the 2012 List. Applications must be submitted to the Holstein Association USA office on or before August 1. Those already on either the National or Qualified Judges Lists can apply by submitting a simple "2012 Judges Update Form." All others must submit the "2012 Judges List Application." Both forms are available for download online at www.holsteinusa.com/shows/judges.html. To be considered for the lists in future years, applicants must have attended a Holstein Association USA Judges Conference within three years. Those on the list must also attend a conference every three years. One conference will be held annually starting in 2012, rotating across the country. For more information about Holstein Association USA Judges Conferences, visit www.holsteinusa.com or contact Jodi Hoynoski at 800.952.5200, ext. 4261. Brattleboro, Vt. (June 30, 2011)…The Holstein Association USA board of directors met June 21 and 22, 2011 in Richmond, Va. President Larry A. Tande chaired the meeting held in conjunction with the National Holstein Convention and Annual Meeting at the Greater Richmond Convention Center. During a dinner on June 21, the board honored retiring President Tande of Medford, Minn., as well as Directors Ron Fuhrmann of Hoagland, Ind., and Kate Geppert of Columbia, Mo. Vice President Chuck Worden of Cassville, N.Y. presented each with a framed resolution, highlighting their service on the board. During the meeting, staff presented updates on the 2011 Management-by-Objective Business Plan and year-to-date financials. Updates on two core objectives included from January through June 18, registrations totaled 165,056 and were up 1,115, a 1 percent increase from the same period in 2010. Through May 31, Holstein COMPLETESM enrollment totaled 246,871 cows and 1,795 herds. These numbers represent a 3 percent increase in cows and a 2 percent increase in herds. During the meeting, Chief Financial Officer and Treasurer Barbara Casna presented the Association's consolidated financial statements as of May 31, 2011 and reviewed the reserve fund report for the same period. Through the end of May, the Association and its subsidiaries show year-to-date profit on operations of $921,000, which is an improvement of $579,000 compared to last year. AgriTech Analytics (ATA) General Manager Bill VerBoort reported May 2011 enrollment of 887,022 cows, which is an increase of almost 54,000 cows from May 2010. ATA has recently added a new report to their lineup. The Sire Group Report provides information on cows, grouped by their sire, and displays averages for production, Mature Equivalent (ME) production, relative values, among other statistics for each group. Be it resolved that Holstein Association USA board of directors has discussed the Dairy Data Alliance proposal. We have serious concerns about the apparent direction. We request further details and encourage further dialogue. We can only lend support to the proposal once our concerns and questions are answered and the resulting proposal is consistent with the dairymen's best interests. The Holstein Association board of directors approved the recommendation of the Holstein Foundation board of trustees to appoint the following trustees, each for a three-year term: Judy Iager of Fulton, Md., Jeff King of Schuylerville, N.Y., and Tom Thorbahn of Vickery, Ohio. The board voted to confirm that future annual meetings of Holstein Association USA, Inc. will retain a two-day business format. On June 25, newly-elected President Worden presided over the reorganization meeting of the board. The directors welcomed incoming Vice President Glen E. Brown of Coalville, Utah, and Directors Roy Buessing of Axtell, Kan., and Mike Jones of Marshall, Ind. Re-elected to their second three-year term are Directors Jim Burdette of Mercersburg, Pa., and Boyd Schaufelberger of Greenville, Ill. The Holstein Association Board will meet November 17 and 18, 2011 in Chicago, Ill.
Brattleboro, Vt. (June 30, 2011)…Holstein Association USA recently held their 126th Annual Business Meeting in conjunction with the 2011 National Holstein Convention in Richmond, Va., June 24 and 25. President Larry A. Tande presided over the meeting. President Larry Tande and Chief Executive Officer John M. Meyer both gave addresses reporting on the current state of the Association and their vision for the membership. "Never before has there been a greater need for leadership in agriculture and our dairy industry," said President Tande. "The future of agriculture is positive and promising, as we assume our role in feeding the world. Truly, we are in a global environment. Leadership is needed in defining our dairy industry's role. " Tande followed by covering some of the topics facing today's U.S. dairy producers, and outlined qualities that individuals should consider when serving on a board or a committee. CEO John Meyer highlighted some milestones from the 125-year history of the Association before reviewing strong 2010 performance, including the following. "Registrations were 339,908, which is a 4 percent increase from 2009," Meyer stated. "Members' appreciation of the Holstein COMPLETESM program is evidenced by the enrollment of 239,703 cows, which is a 3 percent increase over 2009, and 1,759 herds, which is a 2 percent increase." Transfer activity was brisk as 70,335 animals changed hands. This is a 13 percent increase over last year. Other prominent figures included the classification staff evaluating 217,996 cows through the regular classification program, a 3 percent increase over 2009, and the continuing expansion of the TriStarSM Premier program, with 383,000 cows enrolled last year, representing a 1 percent increase. Videos of both addresses are available to watch online at www.holsteinusa.com. Holstein Association USA delegates voted unanimously to adopt the proposed bylaw amendment, which will be effective in 2012. Under Article II – "Officers and Their Duties," Section 1 of the Holstein Association USA Bylaws, the following statement will be added, "Candidates must submit a Conflict of Interest Disclosure Statement to the Nominating Committee prior to closing of nominations at Annual Meeting. Candidates will be screened by the Nominating Committee and a slate of candidates will be presented to the delegates." The full disclosure of any potential conflicts of interest, via these statements, will help the delegates make a more informed decision when they vote for the candidates of their choice. Two officer and three director positions were up for election this year. Chuck Worden of Cassville, N.Y. was elected to a two-year term as president, following two years of service as vice president. Glen E. Brown, Coalville, Utah, won the vice presidential election, and will serve a two-year term on the board. Elected to their first three-year terms as Holstein Association USA directors were Mike Jones, Marshall, Ind., representing Region 3, and Roy R. Buessing, from Axtell, Kan., for Region 7. Jim Burdette, Mercersburg, Pa., Region 2, and Boyd Schaufelberger, Greenville, Ill., At-Large director, were both re-elected to their second three-year term. Retiring from the board of directors this year are Larry Tande, Medford, Minn., who served as president, Region 3 director Ron Fuhrmann, Hoagland, Ind., and Region 7 director Kate Geppert, Columbia, Mo. One resolution was brought forth by the Holstein Association USA board of directors and solidly affirmed by the delegates with a round of applause. "Be it further resolved, that the delegates of this 126th Annual Meeting and National Holstein Convention sincerely thank all of the volunteers at the Virginia Holstein Association for making our week in Virginia an enjoyable one!" The 2012 Holstein Association USA National Convention and Annual Meeting will be held June 27-30, 2012, in Springfield, Mo. For more National Convention coverage, visit www.holsteinusa.com. Additional information will also be available in the Summer 2011 issue of the Holstein Pulse. With questions, contact Lindsey Worden at 800.952.5200, ext. 4096. Brattleboro, Vt. (June 30, 2011)…Three Holstein Association USA members were recognized during the National Holstein Convention annual banquet last week for their outstanding contributions to Holstein Association USA and the Holstein breed as a whole. Brad Groves of Groves-View Dairy in Billings, Mo. was honored as the 2011 Distinguished Young Holstein Breeder. This award is given annually to a Holstein Association USA member or partnership between the ages of 21 and 40, to recognize the significant accomplishments of young Registered Holstein breeders, and their commitment to preserving the dairy industry and achieving excellence in their daily lives. In addition to an award plaque, the winner receives paid travel and lodging expenses to the National Holstein Convention and a $2,000 cash award. Groves has taken a lifelong interest in genetics and worked to breed the best herd of Registered Holstein cattle that he can. Today he and his family are milking 160 cows twice a day. Their ME production averages last year were 34,250 pounds of milk, 1,272 pounds of fat and 1,037 pounds of protein. They classify regularly and have a 107.9 percent BAA, with 18 Excellent, 54 Very Good and 45 Good Plus cattle on their last classification. The Groves-View herd is enrolled in Holstein COMPLETESM and use EASY IDSM with custom ear tags for registration. Brad says, "Registered Holsteins have had a huge financial benefit for us. It doesn't matter what the milk price is, type sells." They have marketed embryos to foreign countries and across the U.S.
Brad and his wife, Gail, have two children, Taylor, age 12, and Kiera, age 10. He volunteers with several groups, including serving as secretary/treasurer for his county DHIA for over 10 years. Groves is involved with planning the 2012 National Holstein Convention and was recently named to the Genetic Advancement board for KABA/Select Sires. Frank Raymond Ruby, of Fir-Ridge Holsteins in Scio, Ore., was recognized as Holstein Association USA's 2011 Elite Breeder. The Elite Breeder honor is given annually to a Holstein Association USA member who has bred quality Holstein cattle and made notable contributions to the breed and Association. Ray passed away in March 2010, but his legacy lives on through his family, wife Ida, children Scott and Michele, and three grandchildren; and the sound breeding program he dedicated his life to. He bred over 100 Excellent cows in his lifetime and over 500 cows scored Very Good. Ruby's herd also excelled in milk production, with over 1,200 cows carrying the Fir-Ridge prefix achieving over 100,000 pounds of lifetime milk, 88 of which went on to make over 200,000 pounds. The herd received Holstein Association USA's Progressive Genetics HerdSM distinction numerous times. Ray's love for the breed was evident, as he expressed in the following statement, made when he was running for the Holstein Association USA board of directors in 1996, "Whether I was milking 20 cows or the 600 cows and 600 young Registered Holsteins that my family and I currently operate, it has always been a very interesting and rewarding experience to be part of the ever-progressive Holstein breed." Numerous organizations benefitted from Ray's involvement through the years. He was a longtime active member of the Oregon Holstein Association and Holstein Association USA, and served two terms on the national board of directors from 1996 to 2003. He was involved as a director for the Farmers' Cooperative Creamery, the Oregon Dairy Farmers Association and his county DHIA. Additionally, he served his community on the Scio School Board for several years, and was a member of the Lions Club. Charles Iager of Fulton, Md., was announced as the 2011 Distinguished Leadership Award recipient. This award is given annually to an individual who has provided outstanding and unselfish leadership to the Holstein Association or dairy industry as a whole. Iager's Maple Lawn Farms has been in the family since 1939. Passed down through the years, they now have 350 Registered Holsteins and 1,000 acres of crops, along with a rapidly growing fresh retail turkey operation. He and his wife Judy have been married for 46 years, working tirelessly for the causes they're involved with. They have three sons, Mike, Matt and Mark, and seven grandchildren. Charles has been a member of Holstein Association USA for 48 years, and a longtime active member of the Maryland Holstein Association, holding several officer and committee positions, including chairing the Scholarship Committee for over 20 years. Iager has always been a strong supporter of youth programs, giving his time as a 4-H and youth leader, and financially through scholarships and sponsorships of youth programs through the Holstein Foundation, National Dairy Shrine, University of Maryland and the Maryland 4-H Foundation. Charles and Judy most recently served as Honorary Co-Chairs of the Holstein Foundation's Dairy Leaders for Tomorrow campaign, giving a pacesetting Chairman's Level gift and successfully spearheading many fundraising efforts. Preserving Maryland's dairy history for future generations is also very important to Charlie, and he has been integral in supporting the Maryland Dairy Shrine. Aside from the Holstein business, Charles has served on the Maryland Dairy Industry Association board of directors, the Maryland & Virginia Milk Producers Cooperative District Leadership Committee, is an Alpha Gamma Rho Alumni board member, a member of Farm Bureau and the Howard County Fair Association. He has been recognized by numerous organizations with leadership and service awards for his dedication and selflessness. See the Summer 2011 issue of the Holstein Pulse for more extensive coverage of Holstein Association USA awards. For more information about annual awards, including applications, visit www.holsteinusa.com/awards/individuals.html or contact Lindsey Worden at 800.952.5200, ext. 4096. Brattleboro, Vt. (June 30, 2011)…The delegate election is underway for next year's Holstein Association USA Annual Meeting, to be held June 29 and 30, 2012, in Springfield, Mo. Nominating petitions have been mailed to members, and must be returned to Holstein Association USA on or before July 25, 2011. Members are encouraged to nominate individuals they think will be interested in serving as an Annual Meeting delegate. It is recommended to nominate more than the number of delegates allowed for their district, in case an elected delegate is unable to serve and an alternate is needed. Once a member is nominated, they will receive notification. Nominees should consider whether or not they will be able to attend the Annual Meeting. If nominees do not wish to serve as a delegate or feel they will not be able to attend the Annual Meeting, they should request their name be removed from the ballot, which must be done no later than August 8. Delegate election ballots will be mailed to members in late August, and are due at the Holstein Association USA office by October 7. Those on the ballot will be notified of the election results in November. Contact Jodi Hoynoski at 800.952.5200, ext. 4261, with questions about the Holstein Association USA delegate election process. Brattleboro, Vt. (June 30, 2011)…The finalists in the 2011 Holstein Association USA National Distinguished Junior Member (DJM) competition were recently named during the National Junior Holstein Convention in Richmond, Va. Being named a DJM finalist is the highest honor a Junior Holstein member may receive, and is based on outstanding work throughout their dairy project career. This year's finalists are Philip Bachman, Ulysses, Pa.; Mitchell J. Kappelman, Manitowoc, Wis.; Kelly Lee, Johnson Creek, Wis.; Elizabeth Olson, Hutchinson, Minn.; Christopher R. Potts, Purcellville, Va.; and Kevin A. Shaffer, Beavertown, Pa. The six finalists were narrowed down from a field of twelve semifinalists that were interviewed during the Convention. Each of the finalists will receive annual renewed memberships to Holstein Association USA. For more information about Holstein Association USA youth programs, visit www.holsteinusa.com/juniors, or contact Kelli Dunklee at 800.952.5200, ext. 4124. At Holstein Association USA's 126th Annual Business Meeting, June 24-25, 2011 in Richmond, Va., delegates will elect officers and directors, vote on one bylaw amendment proposal and any resolutions that come forth. New this year is an earlier deadline to submit proposed resolutions, giving delegates more time to review them before voting. After receiving feedback that resolutions should be provided to delegates earlier, the board of directors incorporated a deadline the day before Annual Meeting begins; however, earlier submissions are encouraged. The new policy states, "A delegate wishing to propose a resolution must deliver it in writing to the Executive Secretary no later than 5 p.m. the night before Annual Meeting begins." Prior to June 17, resolutions can be provided to Jodi Hoynoski at jhoynoski@holstein.com. At National Convention, resolutions may be hand-delivered to the delegate registration desk by no later than 5 p.m. Thursday, June 23. The bylaw amendment proposal delegates will vote on would, if approved, add the following statement to the Holstein Association USA bylaws: "Candidates must submit a Conflict of Interest Disclosure Statement to the Nominating Committee prior to closing of nominations at Annual Meeting. Candidates will be screened by the Nominating Committee and a slate of candidates will be presented to the delegates." Conflict of Interest policies have become common place for companies, both for-profit and non-profit, and their board members. Several years ago Congress approved the Sarbanes-Oxley Act which indicates that all non-profit organizations should have a written Conflict of Interest Policy. The Internal Revenue Service followed up with changes in non-profit reporting standards and recommendations that all board members and officers of non-profits submit a Conflict of Interest Statement annually. For several years all Holstein Association USA directors and officers have been submitting them, and the board would like to see this practice of transparency extended to candidates so that delegates would be aware of any potential conflicts before an election. This bylaw amendment was recommended by the Nominating Committee, comprised of eighteen Holstein Association USA members from around the country, and approved by the board of directors. If approved, the committee would review all Conflict of Interest Statements submitted and recommend candidates to the delegates, unless the committee felt that a particular candidate had a serious conflict of interest that could affect the ability of that candidate to act in the best interest of the Association. A conflict of interest is defined as a situation in which financial or other personal considerations have the potential, real or perceived, to compromise or bias a person's judgment and objectivity. For example, an employee of the Association or a major vendor would likely be considered to have a major conflict of interest. The full disclosure of any potential conflicts of interest, via these statements, will help the delegates make a more informed decision when they vote for the candidates of their choice. President: Chuck Worden, Cassville, N.Y.
Vice President: Glen E. Brown, Coalville, Utah & John C. Kalmey, Shelbyville, Ky. Region 2 Director: Jim Burdette, Mercersburg, Pa. Region 3 Director: Thomas F. Atherton, Gaines, Mich. & Mike Jones, Marshall, Ind. Region 7 Director: Roy R. Buessing, Axtell, Kan.
At-Large Director: Boyd Schaufelberger, Greenville, Ill.
Delegates are reminded that they must be signed in at the delegate registration desk by no later than 9 p.m. on Thursday, June 23. If you are a delegate and know that you will not be able to register by that time, please contact Jodi Hoynoski at 800.952.5200, ext. 4261 prior to June 17 to schedule an alternate registration time. With any questions regarding delegate matters, contact Jodi Hoynoski at 800.952.5200, ext. 4261. Brattleboro, Vt. (June 3, 2011)…Final preparations are underway for the 2011 National Holstein Convention and 126th Annual Business Meeting, taking place June 22-25 in Richmond, Va. The Virginia Convention Planning Committee has assembled a schedule highlighting the state's Registered Holstein farms, historic sites and scenery, while allowing attendees time to discuss Association business. Below is a summary of Convention events; for complete schedule details and information, visit www.holsteinconvention2011.com. Wednesday, June 22, marks the official start of the convention with several Junior competitions, including dairy jeopardy and prepared public speaking. Adults have the option of participating in a golf tournament, touring area farms, or enjoying a shuttle to various stops around the city of Richmond. Thursday, June 23, is the ever-popular host day, showcasing various attractions around Virginia. Four tour options include Colonial Williamsburg, Busch Gardens theme park, tours of area Registered Holstein farms, and a bus tour of Richmond. Concluding a fun day of activities, Convention goers will come together for another annual favorite, Family Night, including a meal, fellowship, and entertainment by The Panic Squad Improv Comedy. Friday, June 24 marks the first day of the 126th Holstein Association USA Annual Business Meeting. The Junior Convention also has a busy day planned with the annual dairy bowl competition. Those not attending the Annual Meeting or dairy bowl have the option to visit Monticello, home of Thomas Jefferson and known for its scenic beauty, with lunch at the historic Michie Tavern. The National Holstein Convention Sale will be held that evening, featuring elite Registered Holstein genetics. Director and officer elections will be the main focus of Saturday morning, June 25, with four director and two officer positions on the board being filled. Declared candidates include, for president, Chuck Worden, N.Y.; for vice president, Glen E. Brown, Utah, and John C. Kalmey, Ky.; Region 2, incumbent Jim Burdette, Pa.; Region 3, Thomas F. Atherton, Mich., and Mike Jones, Ind. ; Region 7, Roy R. Buessing, Kan.; and At-Large, incumbent Boyd Schaufelberger, Ill. Junior members have the chance to enjoy dairy bowl finals, followed by the National Junior Forum and Junior Awards Banquet. The Convention will conclude on Saturday evening with the final Convention Banquet, where the Distinguished Young Holstein Breeder, Elite Breeder and Distinguished Leadership Award recipients will be announced and honored. The Holstein Association USA Annual Business Meeting will take place on Friday and Saturday, June 24 and 25. Starting at 9 a.m., members will hear from CEO John M. Meyer and President Larry A. Tande on Association programs and activities, and CFO Barbara Casna will give a presentation on Association financial performance. The Star of the Breed and Herds of Excellence will be recognized during the meeting, and in the afternoon, members will have the chance to ask questions of the director and officer candidates during the Regional Member Caucuses. Director and officer elections will take place during the meeting, and committee reports will be heard throughout the session. Two speakers will be presenting on some of the dairy industry's hottest topics on Friday, June 24. During the Early Bird session, starting at 7:30 a.m., Dr. Curt Van Tassel of USDA will give an update on genomic technology and applications for the U.S. dairy industry. That afternoon at 1:45 p.m., during the Annual Meeting, members will have a chance to hear from Jerry Kozak, President and CEO of the National Milk Producers Federation (NMPF). The title of his presentation is "Forging a New Path for Dairy Producers," and will cover NMPF's Foundation for the Future plan, a package of proposed dairy policy programs aimed at improving U.S. dairy policy and fostering a more economically-viable and secure future for dairy producers. Following both presentations, members will have a chance to ask questions of the presenters. Holstein Association USA's website, www.holsteinusa.com, will be updated during Convention with pictures, contest results and daily summaries. If you cannot attend the Convention in Virginia, be sure to check in to see the latest news from Richmond. For updates on Convention activities or lodging information, visit www.holsteinconvention2011.com. For more information, contact Lindsey Worden, Communications Manager, at 800.952.5200, ext. 4096. 2010 Holstein Association USA Star of the Breed, Scarlet-Summer RB Gwendelyn, bred and owned by Scarlet Summer Holsteins of Muncy, Pa. Pictured are Marsha Burleigh, with children Madison and Alex, and Jarrod Burleigh on the halter of Gwendelyn. Brattleboro, Vt. (May 12, 2011)…Holstein Association USA's Star of the BreedSM award recognizes a cow that would be many Registered Holstein breeders' "dream;" a cow that can compete with the best both in the showring and with her milk production. The 2010 Star of the Breed is Scarlet-Summer RB Gwendelyn, bred and owned by Scarlet Summer Holsteins of Muncy, Pa. Scarlet Summer Holsteins is comprised of Jarrod and Marsha Burleigh, and their two children, Alex, 7, and Madison, 4. Both graduates of Delaware Valley College, Jarrod is a nutritionist with ADM, and Marsha works at the farm full-time. Gwendelyn, born December 6, 2004, is sired by STBVQ Rubens-ET, out of Mountainside Atomic Gwen, a daughter of Canyon-Breeze Atomic-ET, scored Very Good-85 as a seven year old. Gwen has a top milk record at 5-02, in 365 days, of 53,150 pounds of milk with 4.0 percent fat (2,126 pounds) and 2.7 percent protein (1,435 pounds), with almost 200,000 pounds of lifetime production. Gwendelyn herself is scored Excellent-94 2E, with an EX-96 point udder. She has been turning heads this lactation, making a 365-day record of 58,270 pounds of milk, with 5.2 percent fat (3,004 pounds) and 2.9 percent protein (1,677 pounds). While she was never fresh at the right time to be shown much as a young cow, calving in late December 2009 set Gwendelyn up for a great show season in 2010. She got the year off to an exciting start, being named Grand Champion at the Pennsylvania Spring Holstein Show, later going on to win Reserve Senior Champion honors at the Pennsylvania Fall Holstein Show, and was the fifth place Five-Year-Old at the Eastern Fall National Holstein Show in Harrisburg, Pa. in September. 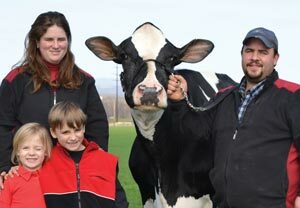 Capping off a fun year, Gwendelyn was the 2010 All-Pennsylvania Five-Year-Old Cow. The Burleighs have offspring and embryos out of Gwendelyn by Erbacres Damion, Regancrest Dundee-ET, KHW Kite Advent-ET and Markwell Kite-ET. Gwendelyn is pregnant, due in mid-November to Scarlet-Summer Shadowmaster, a Regancrest Dundee-ET son of a VG-88 Sunnylodge Linjet that goes back to Jarrod's family's breeding. The family hopes to show Gwendelyn throughout next year, starting in the spring, and is excited to see what kind of milk record she is capable of producing. The Burleigh family milks 90 cows in a tiestall barn, which they built four years ago. They farm 180 acres, growing all the crops they need to feed the cows. The herd is currently averaging around 23,000 pounds of milk, with 1,080 pounds of fat. Their most recent BAA is 110.9 percent with 41 Excellent cows, 34 Very Good and 12 Good Plus animals. Of their breeding philosophy, Jarrod says, "I'd rather have the 'best one' than the 'first one.'" They typically use proven bulls with known transmitting patterns, and like to alternate using bulls that throw powerful cows with bulls that sire dairyness. Scarlet Summer Holsteins is on Holstein COMPLETESM, and classifies regularly. For more information on the Star of the Breed Award, visit www.holsteinusa.com and click on Awards in the main menu. For more information, or to obtain pictures, contact Lindsey Worden, Communications Manager, at 800.952.5200, ext. 4096. Brattleboro, Vt. (May 12, 2011)…Holstein Association USA is proud to announce nine U.S Registered Holstein herds that have qualified for the 2011 Herd of Excellence recognition. These herds have all achieved the rigorous criteria to qualify for this honor, as follows: must be 25 percent above breed average Mature Equivalent (ME) for milk, fat, and protein; must have classified within the last year and have an actual average classification score of 83 points or higher; must have at least 70 percent of the herd homebred; and must be enrolled in the Association's TriStarSM program. Star-Summit Holsteins, Byron Center, Mich.
Family farming and Registered Holsteins are longstanding traditions at Tim Baker's farm, which his grandfather purchased in 1910. Tim's own herd began in 1980 when he received his first calf, and he officially took over management of the farm in 1997. Today, they are milking 60 cows twice daily. Since 1997, Star-Summit has received the Progressive Genetics HerdSM (PGH) award six years and the Progressive Breeders RegistrySM (PBR) award for eight years. Last year, Tim was honored to receive Holstein Association USA's Distinguished Young Holstein Breeder Award. Baker's herd is enrolled in Holstein COMPLETESM, and this is the third time they have received Herd of Excellence distinction. "The motto for our breeding program has always been, 'striving for a balance of production and type,'" says Tim. He looks for sires that transmit body capacity, correct udders, and sound feet and legs, backed by good cow families. He mates each cow as an individual, and doesn't use any one bull too heavily. Currently he is using bulls from the Snow-N Denises Dellia family, as well as some Braedale Goldwyn and Comestar Stormatic-ET sons. "Owning Registered Holsteins has been the most influential aspect of our farming operation, because of the many ways it has generated marketing opportunities," said Tim, adding that it has helped the farm survive in the tough times and provides for improvements in the good times. Tim and his wife Jennifer have three children, Gerrit, 12, Jack, 10, and Elise, 6. Hilrose Holsteins is a family operation with Joe Brantmeier and sons Andy and Jeff sharing the work and decision-making responsibilities. Milking 110 cows in their tiestall barn, they have received PBR recognition for 21 years, and Joe and his wife, Chris, were proud to receive the Distinguished Breeder Award at the 2011 Wisconsin Holstein Convention. This is the fourth time they have been named a Herd of Excellence. The herd is enrolled in Holstein COMPLETE, and uses EASYSM and Tag ID with custom tags for registration. Their goal is to develop cows with long, productive lives, with an emphasis on overall type, udder composite, and components. Some genomic young sires are being used, but they are selective, using bulls from good cow families with high type, such as Comestar Lauthority, Fustead Goldwyn Guthrie-ET, Mr Chassity Gold Chip-ET and Regancrest S Braxton-ET. Their emphasis on longevity has paid off, as the Brantmeiers haves bred over 30 cows that have produced over 200,000 pounds of milk, six that have made over 300,000 pounds and two with over 400,000 pounds of milk (scored VG-87 and EX-92). Joe credits his father as being a good dairyman, advising him to use the best bulls he could and to emphasize udder and feet and leg composites. That advice has paid off, and Joe is excited that the future of Hilrose is in good hands with the next generation. Along with Andy and Jeff, Joe and Chris have a daughter, Sara. Allen Johnson milks 40 cows twice a day, housed in a sand-bedded freestall barn, on his farm in Hamptonville, N.C. He is a 15-year Progressive Genetics Herd, a 13- year recipient of PBR honors, and the herd is enrolled in Holstein COMPLETE. Jafral is a four-time Herd of Excellence. Allen returned to his family's dairy farm in 1972 after serving in the Marines, and spent several years upgrading the herd to registered cattle, because of the added value. Today, the majority of his herd traces back to two families; Rilara Mars Las Ravena, purchased as a heifer in 1981, an EX-91 2E GMD DOM daughter of Marshfield Elevation Tony, and Midway- Crest Conductor Billie, an EX-94 GMD DOM Wapa Arlinda Conductor daughter. Johnson credits the fact that he is working with two main bloodlines with the progress he has been able to make with his herd. Strong, deep-bodied, wide-rumped cattle are the kind that Allen enjoys working with and feels are most productive. He adds, "Don't let anyone talk you out of breeding for production. You can breed for both production and type." With his herd size and genetic pool, Johnson typically uses two or three main bulls as service sires at a time. Currently, he's breeding cows to End-Road Beacon-ET and Coppertop Doberman-ET. Johnson has two family members who work with him on the farm. Nephew Kevin Huie takes care of feeding the herd and field work, and sister Janet feeds the calves. Tom Kestell milks close to 100 Holsteins on his farm, three times per day, with the milking cows housed in a tiestall barn. The Ever-Green-View herd is enrolled in Holstein COMPLETE, are 11-year recipients of PBR distinction and a 19-year Progressive Genetics Herd. Tom and wife Gin's son, Chris, is involved in the operation on a day-today basis, along with their other hired help, who Tom is quick to credit as a key part of the farm's successes. Kestell's goal is to breed cows that produce high volumes of milk with good component levels and sustainable type. Bulls being used in the herd currently include proven sires Charlesdale Superstition-ET, Ensenada Taboo Planet-ET and younger bulls like Ladys-Manor PL Shamrock-ET and Ronelee Toystory Domain-ET. The cow that has had the largest impact in the Kestell herd is an Emprise Bell Elton daughter, Ever-Green-View Elsie-ET EX-92 GMD DOM, with a record of over 52,000 pounds of milk. Tom has been working with this cow family for over 28 years, with several high profile animals tracing back to it, including the current national milk production record holder Ever-Green-View My 1326-ET (Elsie's granddaughter) and the number one TPI international bull from the April 2011 run, Flevo Genetics Snowman-ET (Elsie's great-grandson). "Everything is kept very consistent – the feed, the work schedule," said Tom. "We stay focused on our goals and try to breed good cattle consistently." Kestell merchandises hundreds of embryos annually, along with live cattle. Steve and Amanda Killian have worked hard over the past decade to make continual improvements to their dairy operation and the genetics they work with, starting on their own 11 years ago. Their 80 cows, 40 of them Registered Holsteins, are housed in a tiestall barn and fed a TMR. During the growing season, the cows spend at least eight hours per day on pasture. The vast majority of the Killian's Holstein herd can be traced to Castleholm T Carlo-ET EX-91 3E GMD DOM. Sired by Olmo Prelude Tugolo and backed by several generations of Very Good and Excellent cows, she has made 192,000 pounds of lifetime milk and is still on the farm today. Flushing Carlo to Braedale Goldwyn resulted in Dirt-Road Goldwyn Cami-ET, a cow that has "put them on the map." Cami is scored VG-86 and made a two-year-old record over 32,000 pounds of milk, with a GTPI of +1977. She has 26 registered offspring, sired by a variety of bulls including England-Ammon Million-ET, Long-Langs Oman Oman-ET, Badger-Bluff Fanny Freddie-ET and Ri-Val-Re 2338 Niagra-ET. The Killian's breeding program focuses on type and components, rarely using a bull that is minus for fat or protein. They are using a variety of high genomic young bulls as service sires, striving to keep current with what the market demands, as many of their breedings are for embryo or bull contracts. The couple has five children: Samuel, 10, Christian, 8, Olivia, 4, Bo, 2, and Jack, who is five months old. This is the third time Dirt-Road Holsteins has been named a Herd of Excellence. Rodger Koehn and his family are milking 124 Registered Holsteins twice daily on their farm, located approximately an hour south of Chicago. The cows are housed in a sand-bedded freestall and milked in a stanchion barn. K-Lane has received the PBR award for three years. Rodger mates each cow individually and uses a variety of bulls, focusing on high type; typically at least 2.0 for type, with special emphasis on udders. The aAa system is also used as a tool in the K-Lane breeding program. Koehn currently has two cows on the National Production Leaders lists. K-Lane Pat Apple VG-87 is the fifth place Junior Four-Year-Old for Fat (2X milking) and Ms Price Meyer Star VG-85 is the first place for fat and fourth for milk production in the Senior Three-Year-Old 2X category. Another notable homebred cow is K-Lane Durham Melissa, scored EX-92 2E, working on her fourth consecutive record over 40,000 pounds of milk, with a lifetime milk record over 200,000 pounds. Koehn has a herdsman and assistant herdsman who are valuable additions to the operation. His family is also a key part of the farm; Rodger's wife, Rhonda, milks and is very active with the farm, and they have three children who are all involved when not at school. Rick, a student at Joliet Junior College, is 20, Rachel is 15, and son Riley is 11. 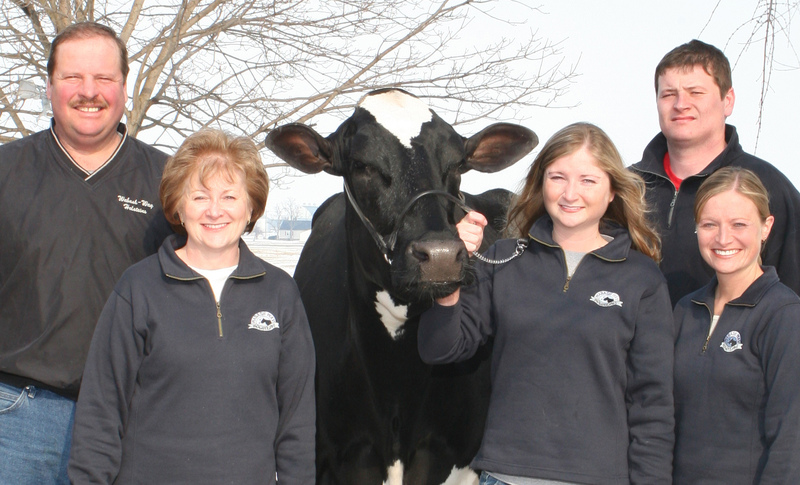 Bruce and Brenda Long started B-Long Holsteins in 1990, after working on Brenda's parents' farm following graduation from the University of Wisconsin-River Falls. They now milk 55 Registered Holsteins in a tiestall barn twice a day. The Longs have three sons, Bryant, 21, and twins Brandon and Bret, 20. They received have received the Herd of Excellence award four years running, were Holstein Association USA's Distinguished Young Holstein Breeders in 2007, and are a 15-year Progressive Genetics Herd. Over 80 percent of their current herd can be traced back to two calves Bruce purchased when he was 14 years old. Another 10 percent descend from animals from Brenda's home farm. When choosing bulls to use on the farm, Bruce and Brenda's goal is to breed for large, powerful cows with big frames, plenty of strength and width, and good components. The Longs place an emphasis on cows that will live a long time, produce high volumes of milk, and transmit those qualities to their offspring. Over the years, they have developed 20 Gold Medal Dams and 10 Dams of Merit. Four cows they bred have produced over 300,000 pounds of milk, with the highest being B-Long Elton Gypsy VG-86 GMD, who produced 341,980 in seven lactations. Over 20 more cows have produced over 200,000 pounds of lifetime milk. Cow comfort is a high priority, and cows are given access to pasture year-round, which they feel helps the soundness and longevity of their herd. Merlin and Peggy Rohm describe their home farm as a small operation, a partnership that allows them to pay attention to details that can make a big difference in the long run. The couple milks 70 cows twice a day in a tiestall barn. They have received PBR recognition for 12 years and have been named a PGH for six years. The Rohms' herd is enrolled in Holstein COMPLETE. Rohm says they enjoy working with good pedigreed animals and the marketing opportunities Registered Holsteins provide them. They have several cows under contract right now, and strive to keep current with genetic trends while still using bulls they have confidence in. Some bulls being used in the herd currently include Jenny-Lou Mrshl Toystory-ET, Schillview Oman Gerard-ET, Ladys-Manor PL Shamrock-ET and Dream-Prairie Shadow Boxer. A special cow for the Rohms has been See-More-View Design Polly, an EX-91 2E daughter of Raggi Marshall Design-ET. Merlin says that she has had a contract every year she's calved in, and her first daughter is a VG-87 O-Man daughter with a +2080 CTPI. Merlin and Peggy have two daughters, Kate (married to Dane), who works in the marketing division of Sargento Cheese, and Kimberly, who is currently in college studying graphic design. Merlin's father is also still active on the farm, helping with the fieldwork for their 300 acres. Jake Tanis' early beginnings in the dairy industry were growing up on his parent's Guernsey farm in New Jersey. He began breeding Registered Holsteins because he was impressed by the strength, dairyness and quality udders that the breed possesses. Jake and Sallianne have farmed at their central Pennsylvania dairy for over 20 years, and received the PBR recognition for 15 years. They have received the Herd of Excellence award all four years since it was introduced. The Tanis family made the decision to disperse their herd, selling 159 head on April 16, almost 40 years after they held their Guernsey dispersal. In regards to how he has managed his herd through the years, Jake says, "We try to bore the cows to death. If you want to make them milk, do the same thing the same way, every time. It's important to pay attention to the small details." He also offered some advice for young people getting started in dairy farming. Tanis recommends finding the type of cattle you like to work with, and to stick with it. He also emphasized the importance of finding a mentor in the business, someone who has been successful and has achieved goals that are similar to yours. "I have enjoyed dairy farming beyond belief," Jake says. "It's always something that I have enjoyed. I'd like to thank everyone who has been involved through the years. It's been great." Though his cattle are gone, Jake has no plans to take it easy; he has plans to grow crops and also board some heifers. For more information, or to obtain pictures of the honorees, contact Lindsey Worden, Communications Manager, at 800.952.5200, ext. 4096. Brattleboro, Vt. (April 8, 2011)…Holstein Association USA is excited to name 12 young people as semifinalists in the annual Distinguished Junior Member (DJM) competition. The DJM award recognizes outstanding Holstein youth, ages 17 to 21, and is the highest honor that can be given to a Junior member. The award recognizes a lifetime of commitment to the Holstein breed and involvement in variety of activities. The twelve semifinalists are Philip Bachman, Ulysses, Pa.; Danae Bauer, Scandinavia, Wis.; Mandy Brazil, Petaluma, Calif.; Mitchell Kappelman, Two Rivers, Wis.; Kelly Lee, Johnson Creek, Wis.; Carl Lippert, Pittsville, Wis.; Aaron Mitchell, Winnebago, Ill.; Elizabeth Olson, Hutchinson, Minn.; Christopher Potts, Purcellville, Va.; Luke Rauen, Farley, Iowa; Kevin Shaffer, Beavertown, Pa.; and Dan Stewart, Oelwein, Iowa. "Dairying is much more than a profession; it is a lifestyle," wrote Mandy Brazil, Calif., in her book. "Growing up around the dairy industry has been a driving force in developing who I have become today. I have learned dedication, responsibility and leadership skills." "I want to be an influence to this industry someday as it has been an influence to me," said Carl Lippert, Wis., in his story. "I hope to continue pushing my family operation to strive for the best standards of product quality, animal welfare, and continue to incorporate new technology and strong Holstein genetics in the future." Junior Holstein members, ages 17 to 21 are eligible to apply for the Distinguished Junior Member recognition. The 12 semifinalists will complete interviews at the National Junior Holstein Convention in Richmond, Va. in late June to be named one of six finalists. All finalists receive annual renewed membership to Holstein Association USA. For more information about DJM or other Holstein youth programs, visit www.holsteinusa.com/juniors, or contact Kelli Dunklee at 800.952.5200, ext. 4124. Brattleboro, Vt. (April 8, 2011)…Holstein Association USA is pleased to announce eight finalists in the annual Young Distinguished Junior Member (YDJM) competition. The YDJM award recognizes Holstein youth, ages 9 to 16, for their accomplishments working with Holsteins, achievements and leadership in Holstein activities, as well as school and community involvement. The eight finalists are Anna Culbertson, Pine Island, Minn.; Elizabeth Davis, Union Bridge, Md. ; David Hardesty, Jr., Berryville, Va.; Jaylene Lesher, Bernville, Pa.; Jessica Pralle, Humbird, Wis.; Ruben Schappman, Abbeville, Ga.; Jacob Shaffer, Beavertown, Pa.; and Crystal Siemers-Peterman, Cleveland, Wis. In his Story of Junior Project Work, David Hardesty, Jr., wrote, "I am well aware of the importance of working hard to maintain our business and promote the dairy industry in order to continue our longstanding family tradition of farming for a living. Growing up on a dairy farm, one learns a lot about discipline and commitment to purpose. I attribute many of my personal strengths to living and working on a farm, along with my participation in Junior Holstein activities and contests." "Growing up and being actively involved in our dairy farm has given me a great perspective," wrote Jessica Pralle, Wis. "It's educated me in life lessons had has given me the change to do something I love, that is working with dairy cattle. I'm only a sophomore in high school, but I already know my future will be in the dairy industry." For more information about DJM or other Holstein youth programs, visit www.holsteinusa.com/juniors, or contact Kelli Dunklee at 800.952.5200, ext. 4124. Brattleboro, Vt. (April 6, 2011)…President Larry A. Tande presided at the spring Holstein Association USA, Inc. board of directors meeting held in Brattleboro, Vt., March 24-25. The Business Plan portion of the meeting included updates on 2011 objectives. The board heard reports from the Audit, Nominating, Genetic Advancement, Legislative Affairs, and Show committees. Member participation in the programs and services provided by the Association demonstrate an encouraging start to the year. Management reported registrations through March 19th of 80,406, up 0.5 percent from 2010. Holstein COMPLETESM enrollments totaled 243,628 cows and 1,773 herds, an increase of 5 percent and 4 percent respectively over the same time last year. The board approved a one-day annual business meeting format beginning at the 2014 National Holstein Convention in Iowa. The more efficient one-day format will make serving as a delegate less of a time commitment for members and ease some of the planning burden on host states, while still allowing ample time for discussion of Association business. "Candidates must submit a Conflict of Interest Disclosure Statement to the Nominating Committee prior to closing of nominations at Annual Meeting. Candidates will be screened by the Nominating Committee and a slate of candidates will be presented to the delegates." This proposal will be presented to Holstein Association USA delegates in 2011 and, if passed, will become effective in 2012. Early genetic information resulting from genomic testing could create a situation wherein an animal could qualify for the Dam of Merit recognition without being a milking female. In order to maintain the integrity of this permanent recognition, the board approved criteria changes which state, "In order to be recognized as a Dam of Merit, a cow must have a GTPISM or CTPISM exceeding year of birth cutoff and at least three offspring with a PTA for production and type; the GTPI or CTPI must be calculated using a required classification score." The board approved a requirement that a bull must have at least 10 U.S. daughters in order to be eligible for inclusion on the domestic Top 100 TPI Bull List. Also, the board approved the recommendation to declare Brachyspina as an undesirable recessive, and approve the recording of the testing results with the coding of BY for carrier and TY for tested free. Visit the Holstein Association USA website for more information about Brachyspina. The board approved a policy requiring delegates who wish to propose a resolution to deliver it in writing to the Executive Secretary no later than 5:00 p.m. the night before the annual meeting. The next board of directors meeting will be held June 21-22, in Richmond, Va., in conjunction with the Association's Annual Meeting and Convention. The fall board meeting will take place in Chicago, Ill., November 17-18. Holstein COMPLETESM, Dam of MeritSM, Total Performance Index (TPI)SM, GTPISM and CTPISM are servicemarks of Holstein Association USA, Inc.
Brattleboro, Vt. (March 25, 2011)…At their recent meeting, the Holstein Association USA board of directors voted to declare Brachyspina as an undesirable recessive trait in the Holstein breed, and approved the recording of testing results on Holstein Association USA pedigrees and other performance products. Brachyspina is expressed when an animal is homozygous for the undesirable allele, meaning that two carrier animals have been mated. Holsteins that are known carriers will be labeled with the code BY, and tested non-carriers will be labeled TY. "It's our belief that labeling the carriers of Brachyspina will give breeders the information they need to dramatically reduce the frequency of the undesirable recessive allele in the Holstein breed. In the interim, top genetic animals, identified with BY, can still be used with some attention given to the pedigree of the potential mate" said Dr. Tom Lawlor, Holstein Association USA Director of Research and Development. It is estimated that approximately 6 percent of Holstein cattle carry the gene for Brachyspina, which can cause embryonic death, stillbirth or other physical deformities. In a random mating population, it's estimated that 1 out of 1,000 matings would result in early embryonic death and an increase in days open. For more information, contact Holstein Association USA at 800.952.5200. Brattleboro, Vt. (March 11, 2011)…Holstein Association USA is planning three Judges Conferences for 2011. All people currently on the Holstein Association USA National or Qualified Show Judges Lists, or those wishing to apply for the lists in future years, will be required to attend one conference every three years and receive a satisfactory rating before applying. In 2011, three conferences will be held across the country; in subsequent years, one conference will be held annually, rotating between eastern, midwestern and western regions. Dates and locations for the three 2011 Holstein Judges Conferences are May 17, 2011 in Richmond, Utah; August 16, 2011 in Fond du Lac, Wis.; and September 20, 2011 in Harrisburg, Pa. The conferences will run from 8:00 a.m. to 3:00 p.m. and include placing heifer and cow classes, as well as classroom time. The fee to attend will be $50 for pre-registrants and $100 for late registrants. Pre-registration will close two weeks prior to each conference and is now available online at www.holsteinusa.com. Online registrants may pay with a credit card through a secure online payment site. Late registration will be accepted from the pre-registration closing date until the morning of the conference. Walk-ups may pay the $100 late registration fee by cash or check at the door, however, pre-registration is strongly encouraged. The Judges Conferences are open to anyone 22 years of age or older who is interested in judging U.S. Holstein shows and/or applying to be included on a Holstein Association USA Judges List, including international judges. As a reminder, starting in 2012, all National Holstein Show judges will only be selected from Holstein Association USA's National Judges List, and all associate judges or nationally-sanctioned Junior Show judges must be on the National or Qualified Judges Lists. More details about the conferences, including registration and suggested lodging information, can be found at www.holsteinusa.com/shows/judges.html, under the Judges Conferences tab. With questions, contact Peter Cole at 800.952.5200, ext. 4127, or Jodi Hoynoski at ext. 4261. Brattleboro, Vt. (March 10, 2011)…The following information is based upon an article written by Bennet Cassell, professor emeritus at Virginia Tech and George Wiggans, research geneticist at USDA-AIPL, entitled, "Adjustments make all cow PTAs similar to those on genomically tested cows." A link to the article in its entirety may be found at the bottom of this page. Some of the tables and information below have been taken directly from the referenced article. Background – Why More Rescaling? In April 2010, USDA introduced two new procedures to the national genetic evaluations, which generated a great deal of discussion and interest within the industry. First, imputation of genotypes, cows with a number of genomically tested progeny (typically five or more) had their genotypes imputed. Meaning, if a cow had enough information available between her genomic-tested offspring and sire to be able to derive (or "impute") her genotype with a high level of accuracy, she received a genomic prediction. The second change, which had a larger impact on cow PTAs, was USDA "rescaling" PTAs of cows with genomic information. Rescaling is the process of scaling down the difference between the cows' PTAs and her PAs (Parent Averages). The rescaling of PTAs, in 2010, was done only to animals with genomic predictions, which created the important problem that, since non-genomic animals had not had their PTAs rescaled, the PTAs of genomic-tested cattle could no longer be compared side-by-side with PTAs of non-genomic tested cattle. Beginning with the April 2011 genetic evaluations, USDA-AIPL will adjust the PTAs on all Holstein, Jersey and Brown Swiss cows, whether genomic tested or not, to make all evaluations more directly comparable. It is important to note that ONLY PTAs for milk, fat (pounds and percent) and protein (pounds and percent) are affected. The improvements made to the PTAs on older cows will trickle down to the genetic evaluations of their progeny. This process will result in better estimates of parent averages. Rescaling of cow PTAs begins with the within-year Parent Average. To do this, cows are broken down into 10 groups (for each birth year) based on their PA. PTAs on cows with a low PA are scaled up and PTAs on cows with a high PTA are scaled down. If the difference between a cow's PA and the average PA for the birth year is large, larger adjustments will be made. The correlation between the current PTA Milk and the adjusted PTA Milk is over 0.99, so changes in rank are expected to be small for almost all cows. Research has shown the adjusted PTAs of cows included in the genomic evaluations still tend to be slightly biased upwards. Therefore, the traditional PTAs of any Holstein cow that obtains genomic information will be subjected to a reduction of 221 pounds of milk, 8.8 pounds of fat and 6.4 pounds of protein. This represents the average difference between the overall combined PTA on genotyped cows and the PTA obtained directly from the genetic markers. This adjustment is much smaller than the one made in April 2010. A. Within year of birth, adjustment for PA.
B. Adjustment for difference between PTA and PA.
C. Average adjustment for all genomic tested cows. The PTAs on high families are brought down and the PTAs on low families are brought up. Rescaling of individuals, within a family, also takes place. Individual cows, where their PTA is much greater than their PA, are brought down. And for cows where their PTAs are lower than their PA, their PTAs are brought up. The actual amount of change for each individual adjustment will also depend upon her reliability value. Cows with a high reliability will have less of an adjustment; cows with a low reliability will have more of an adjustment. Newly genomic tested cows will receive a third reduction. Another 221 pounds of milk, 8.8 pounds of fat and 6.4 pounds of protein is subtracted from the traditional PTAs of Holstein cows before being included in the genomic prediction population. This helps ensure the accuracy of all genomic tested animals. The new “all-cows” adjustment will have a minor effect on cows which previously received a genomic PTA. The average PTA Milk for the top 100 cows with genomic information will change by –24 pounds. This is because these cows were already adjusted last April. For them, the new procedure is just a refinement. The top 100 cows without genomic information will see a much larger change, -397 pounds, similar to what happened to the genomic cows in April 2010. The difference in PTAs for cows with genomic information versus those cows without is much smaller. In April 2010, the top 100 cows without genomic information were +485 higher. In April 2011, the difference will be +112 pounds. One would expect that the top 100 genomic tested cows would be superior. And this will be the case in April 2011. Remember, a top100 cow without genomic information will experience a 221 decrease in PTA Milk, when they are genomic tested. Therefore, if both groups are genomic tested, the current top 100 genomic-tested cows remain at 1871 and the top 100 non-genomic cows would experience a 221 reduction in their PTA Milk. In the end, this rescaling will improve the overall accuracy of genetic evaluations, and will be a more accurate predictor of true genetic merit. Because the adjusted PTAs will impact a cow's progeny, it is expected that PAs will be a better indicator of expected merit. PTAs of genotyped and non-genotyped cows will be able to be compared more fairly and accurately than what was possible in 2010, and the overall result of the changes will be an improved method of identifying outstanding females. Read the complete article by Bennet Cassell and George Wiggans here. Brattleboro, Vt. (March 8, 2011)…Corbin Wood, Littlestown, Pa., is the winner of the 2010 Overall Judi Collinsworth Outstanding Exhibitor Award from Holstein Association USA. This award recognizes youth for their outstanding Holstein project work, involvement with their cattle and dairy activities. Wood will receive a $500 scholarship, and is the sixth Junior Holstein member to receive this recognition. "It is truly an honor to receive this award as a Junior member who enjoys all aspects of the showring; the competition, sportsmanship, herdsmanship, and marketing opportunities," said Wood. "Being a Junior Holstein member has taught each of us, as dairy youth, many valuable lessons as we exhibit cattle, attend conventions, and participate in youth contests. The Junior Holstein Association has a lot to offer all of us in our lives." Corbin is the 20-year-old son of Steve and Chris Wood, and is working towards his degree in Building Construction Technology and Management at the Pennsylvania College of Technology. He enjoys being very involved in their home operation, Penn Gate Farm, caring for their 100 Registered Holsteins. He received the Judi Collinsworth Award at the Premier National Junior Holstein Show in Harrisburg, Pa. in September. Wood has been an active member of the Pennsylvania and National Junior Holstein Associations for the past 12 years. He annually attends Holstein Conventions and has competed successfully in several activities, including dairy jeopardy, the folding display contest and prepared public speaking at state and National levels. In 2007, Corbin was named a state and National Young Distinguished Junior Member (YDJM). Showing his Holsteins is another favorite activity, and through the years, Wood has received several National Junior Breeder awards, All-Pennsylvania, Junior All-Pennsylvania and Junior All-American nominations and awards. He has won several fitting and showmanship competitions, and recently, after placing in the top ten several times, Corbin placed second in the All-American Youth Fitting and Showmanship Contest in Harrisburg, Pa. The Collinsworth Award is presented annually, in memory of former Holstein Association USA Executive Director of Member and Industry Services, Judi Collinsworth. Winners are selected at each of the four National Junior Holstein Shows, based on sportsmanship, herdsmanship and level of participation in Holstein activities. All winners receive $250 and are invited to apply for the Overall Collinsworth Award. Other winners at 2010 National Junior Holstein Shows were Tyler Schafer, Kingfisher, Okla., Southern Spring National Junior Holstein Show; Kyle Demmer, Peosta, Iowa, International Junior Holstein Show; and Kyle Natzke, Fond du Lac, Wis., Grand National Junior Holstein Show. Applications for the Judi Collinsworth Award are available online at www.holsteinusa.com/juniors, or at each of the four 2011 National Junior Holstein Shows. For more information on Holstein youth activities, contact Kelli Dunklee at 800.952.5200, ext. 4124. Dubuque, Iowa (February 25, 2011)…During his State of the Association report at the Region 6 Member Meeting in Dubuque, Iowa on February 25, Holstein Association USA CEO John M. Meyer reported strong member participation in a variety of Association programs over the past year. "Registrations are the core of all pedigreed livestock associations," said Meyer. "In 2010, 339,908 Holsteins were registered which is 12,286 or 4 percent more than 2009, the second highest total in the last 12 years." In addition to that, strong growth was seen in transfer activity, with 70,335 animals changing hands last year, which is a 13 percent increase over 2009 totals. Meyer added, "Members' appreciation of the Holstein COMPLETESM program is evidenced by the enrollment of 239,703 cows, which is a 3 percent increase over 2009, and 1,759 herds which is a 2 percent increase." Holstein COMPLETE is a program which integrates registration, pedigrees, classification, production records, genetic reports and mating information into one convenient, economic package. The Association's team of classifiers evaluated 217,996 cows through the regular classification program in 2010, representing a 3 percent increase over the previous year. On the other hand, 15 percent fewer animals through the Sire Evaluation for Type (SET)SM program, which is performed for the A.I. industry. Participation in the TriStarSM Premier program participation continues to rise, with a total of 300,083 cows enrolled, which is a 1 percent increase over a year ago. "The Holstein Association's program growth is particularly significant when one considers the contraction of the dairy industry in recent years," stated Meyer. "For example, in 2009, there were 9.09 million cows and 65,000 herds in the United States, which is 240,000 fewer cows and 2,000 fewer herds than were in the U.S. in 2008. Gaining market share in this economic environment is challenging, but the numbers reveal the value dairy producers place on the Association's programs and services." In closing, Meyer added, "As we celebrate the wonderful history of the Holstein Association USA and the world's greatest cow, the U.S. Registered HolsteinSM, we have a lot to be optimistic about. We have the cows and people to ensure a bright future for everyone involved in U.S. Registered Holsteins." Brattleboro, Vt. (February 16, 2011)…Following a recent vote by the Holstein Association USA, Inc. board of directors, a new Total Performance Index (TPI) will be implemented with the April 2011 national genetic evaluations. Discussions regarding the TPI formula were re-opened following a resolution brought forth at the 2010 Holstein Association USA Annual Meeting in Bloomington, Minn. The resolution, submitted by the Wisconsin Holstein Association and affirmed by the delegates, asked the board of directors to "re-evaluate the TPI formula and raise the type contribution to a level that more accurately reflects what breeders desire for a balance of type and production." The TPI formula was last amended in January 2010. The table below compares the averages of the top 100 TPI bulls (having at least 85 percent reliability to qualify for the Top 100 list), comparing the new April 2011 TPI formula, the previous TPI formula (January 2010), and also the Net Merit (NM$) formula. As the table illustrates, the April 2011 formula results in higher averages for all type traits, addressing the issues raised by the delegate resolution. It also shows slight increases in the averages of all production traits. The new TPI formula places significantly more emphasis on type traits than the Net Merit $ formula, results in a higher average for PTA Milk, comparable averages for pounds of fat and protein, and slightly lower averages for the health traits. In an earlier announcement, Holstein Association USA released the new trait weightings for the April 2011 Total Performance Index (TPI)SM formula. They included the removal of five percent weighting from Productive Life (PL), and the addition of an extra one percent emphasis to PTA Protein (PTAP), two percent to Udder Composite (UDC), one percent to Feet and Leg Composite (FLC) and one percent to Daughter Pregnancy Rate (DPR). In order to keep the mean TPI and its spread (standard deviation) constant, we need to update two values, i.e., the 1815 (to update the mean) and 3.7 (to equalize the spread). The new updated values are 1832 and 3.8. Currently, the cows born from 2003 to 2007 have an average TPI of 1297, with the top cow having a TPI of 2333. If we were to change just the trait weightings, all cows would drop a little and the top cow would drop by 49 points. By updating the formula with the values 1832 and 3.8, our TPI values will be directly comparable to the old values, allowing breeders to more easily see how the change in trait weightings impacted each individual animal. TPI values for cows born between 2003 and 2007. The updated April 2011 TPI formula appears above. The other change that will happen in April 2011 is that non-genomic cows will be put on a "level playing field" with animals that do have genomic evaluations, by having their genetic values rescaled by USDA. This process was done to animals with genomic evaluations in April 2010. Holstein Association USA will provide more information for the membership as it becomes available from USDA in the coming weeks. For the most up-to-date information about how changes will impact Holstein breeders, visit www.holsteinusa.com. Total Performance Index (TPI)SM is a servicemark of Holstein Association USA, Inc.
As of February 1, 2011, a change has been made to the way Stature is evaluated in Holstein Association USA's Classification program. A recommendation was made by the Type Advisory Committee (TAC) and approved by the board of directors in November 2010, that any cow falling outside of what is considered to be within the breed standard height of between 56 and 62 inches tall (as measured at the spine, between the hips) will be deducted two points from the Front End/Capacity category. This equates to a deduction of 0.4 points from a cow's final score. As is standard policy, cows that are evaluated at less than two years of age will have their stature score age-adjusted. As an example, a cow scoring 87 for Front/End Capacity would only receive a score of 85 for that breakdown if she was shorter than 56 inches or taller than 62 inches, as measured at the spine, between her hips. "Statistics show that the Holstein breed is getting taller, and we're seeing where it's causing dairymen to have to remodel the stalls in their tiestall and freestall barns to accommodate larger cows," states John Connor, Holstein Association USA Director of Type Evaluation. "Very few cows will lose points as a result of them being too tall or small, but the TAC felt it was their duty, as an Association representing Holstein breeders across the country, to put this new policy into place." Stature is the most heritable type trait measured by Holstein Association USA, at 0.42. Continual selection for stature in the population will bring about a phenotypic response that can easily be measured. For example, the average STA for Stature of the Available Bull Population in February 2006 was 0.74 (Tall); in December 2010, the average STA Stature of the Available Bull Population was 1.33 (Tall). When the January 2010 base change is added to that (+0.70), the real change in STA Stature is +1.29. On a linear scale, this equates to a significant change of +2.33 linear points (or about half an inch in stature) in less than five years. "The message that this change sends is that we do not want the Holstein breed to continually progress in a direction that will result in extremely tall cows that must be housed and managed specially and differently from the majority of the herd, just to be able to keep them in the herd," added Connor. As an Association, it is important to consider the future of the Holstein breed, the direction that the U.S. Holstein population is headed, and how that relates to the U.S. Registered Holstein being the breed of choice for dairy producers worldwide, now and into the future. Classifiers are asked to communicate this new policy at all herds they evaluate cattle for, even in cases where cows are unaffected. With questions, contact the Classification department at 800.952.5200, ext. 4263.